Philippine President Rodrigo Duterte gestures as he talks during the 115th Police Service Anniversary at the Philippine National Police (PNP) headquarters in Manila, Aug. 17, 2016. 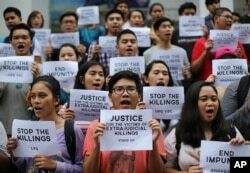 The brash-talking Philippine president criticized the United Nations on Wednesday for condemning the spate of killings of suspected drug criminals in his country while allegedly keeping silent on deadlier violence in the Middle East. In a speech at the national police headquarters, Duterte said the deaths tallied in his anti-drug campaign include those who engaged in shootouts with police, as well as those killed by other drug criminals. FILE - Filipino student activists shout slogans as they call for justice for victims of extrajudicial killings during a rally at the University of the Philippines in suburban Quezon city, north of Manila, Philippines, Aug. 11, 2016. “For those who are killed by the other drug syndicate we can only investigate, but do not attribute the acts of other criminals upon my government,'' he said. According to the national police count, as of last week, more than 500 have been killed in gunfights with police and nearly 8,000 have been arrested in the government anti-illegal drugs campaign. But local media and other groups have higher tallies, some nearly 1,000, and have included apparent victims of summary killings. Duterte said he will not relent in the fight against drugs until the apparatus of drug traffickers is destroyed. Duterte was not specific, but Ban has addressed a number of conflicts around the globe in recent days. The U.N. chief on Tuesday condemned a reported airstrike on a hospital in Yemen that killed at least 11 people. The same day, he launched an investigation into U.N. peacekeepers' alleged inaction during a violent rampage of troops in South Sudan. Over the weekend, Ban condemned an attack by suspected rebels that killed at least 36 people in northeastern Congo. Duterte made an earlier profanity-laced tirade against the U.N. when he was president-elect in June after foreign and local media group criticized his comments that corrupt journalists were legitimate targets of assassination.